In 1888, the Chilton family ancestors arrived in Arizona driving several hundred cattle. The first Chilton Ranch was established near the pioneer town of Livingston, along the Salt River, where Roosevelt Lake is now. Jim Chilton grew up on Arizona farms and ranches. He graduated from Camp Verde High School and went on to earn three degrees in economics and political science. (B.S., M.S., M.A.) from Arizona State University. He met his future wife, Susan Chemnick, when she was elected freshmen class senator and assigned to the Senate Education Committee, which he chaired. After earning his degrees at ASU, Jim worked for the Salt River Project as an economic analyst. Thereafter, he joined the staff of Arizona's legendary U.S. Senator, Carl Hayden, before beginning his career in municipal financing. In the meantime, Sue continued her education at ASU and earned her Arizona teaching credential as well as a Masters in Spanish Language and Literature. Jim, a rancher by heritage, became a full partner in the Chilton family ranching business in 1979 when he and his dad, Ken Sr., bought the Diamond Bell Ranch, west of Tucson. Ken had sold the 7 + A Upper Eagle Creek Ranch, located in the area where their Cosper ancestors had been pioneer ranchers. (Brother Tom joined the ranch in 1979.) In 1987, Jim and Sue purchased a ranch and home just south of Arivaca. They purchased the neighboring Flying X ranch in 1991 to expand the production capability of the family enterprise. The Chiltons have been Cooperators with the U.S. Natural Resources Conservation Service (NRCS) since 1980. Upon buying their Arivaca ranches that include two allotments on the Coronado National Forest, the Chiltons implemented a grazing management program providing for rotation of cattle to ensure re-growth and an increase in desired native perennial grasses. They greatly expanded their resource data collection, starting in 1996, by undertaking a detailed riparian survey. In 1998, they invited Professor Jerry Holechek, of NMSU, and Dr. Dee Galt to do monitoring, utilization and production studies on-site. 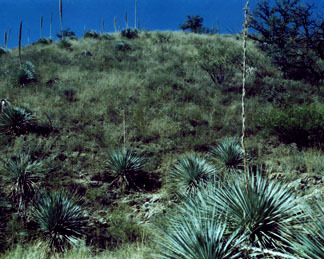 The Chiltons did extensive photo monitoring and information collection on native plants and wildlife on their ranch. All of this data became very relevant in their battle to renew their grazing permits against the determined, repeated assaults of anti-ranching activists. One of Jim's allotments, the "Montana", became the object of intensive attacks and the focal point of the (court case) he recently won against the Center for Biological Diversity. A Tucson jury found the Center guilty of malicious, knowing misrepresentations concerning the conditions on the well-managed allotment. The jury also found that the Center for Biological Diversity unlawfully interfered with the Chilton family's ranching business. Sue was named by Governor Jane Hull to serve a 5-year term on the Arizona Game and Fish Commission. She spent five years working to improve relations between the Game and Fish Department and rural residents who provide wildlife habitat. Jim was named “Rancher of the Year” in 2003 by the Arizona Cattle Growers’ Association. In 2005, he was honored with the “True Grit” award from the Arizona Cattle Growers and the “Individual of the Year” award from the Arizona/New Mexico Coalition of Counties. Also in 2005, he and Sue were awarded both the Arizona Farm Bureau “Oscar” for outstanding achievement and the Farm Bureau “Environmental Stewardship” award. In 2009, Jim accepted the Arizona/New Mexico Coalition of Counties “Arizona Organization of the Year” award for the work of the Arizona Cattlegrowers’ Federal Lands Committee which he chaired from July 2007 through July 2009. Jim and Sue raised two sons, James K. Chilton, III (Ken) and Thomas Carl Chilton (Tomás). Jim and Sue have two grandchildren, Ben and Mykenna. Their older son Ken is a municipal investment banker. He is married to Jamie Weiss Chilton, an editor and literary agent for authors of books for teens and children. Their younger son Tomas is Game Director for Activision-Blizzard’s hit game “World of Warcraft.” He and his wife Doris Vo Chilton live in Irvine, California.